Posted on 8 Mar 2013	by meg seitz. When childhood friends and Charlotte residents, Coby Kraft and Brad Schamel, started Moxy Events – “Moxy”, for short — the concept was relatively simple – create different, fun, innovative fitness events. More specifically, invent unique workouts that provide Charlotte athletes a comparable alternative – in time, training, and money — to the traditional workout or the Saturday morning 5k or 10k. They partnered with some of the Charlotte community’s most talented fitness instructors to develop a company that produces challenges that rival not just the 5k – but the marathon. It started with the Moxy Box Crawl last November. Four hours of hard, fast workouts at a handful of CrossFit boxes located in metro Charlotte. It highlighted trainers and showcased facilities. And it pushed athletes’ buttons. 70 people paid to participate in this inaugural box crawl, including six different CrossFit WODs and a running workout between gyms across the city. They raised around $1,500 to distribute between two different organizations — Kate Foster (Kate is a 13-year-old CrossFit’er who attests to the power of CrossFit in her battle with leukemia) and Team Red, White, & Blue — an organization dedicated to connecting veterans to communities through physical and social activities. The entire experience was a first for Charlotte, carved out by two guys who just wanted the community to experience an aggressive, fun sweaty pursuit come Saturday morning. “It was important to participate in the Moxy Box Crawl because CrossFit is about getting together as a community for one common goal — to get fit and have fun doing it, “says Sean Chamberlain, Fitness Director for Metro CrossFit and Training Center, the box that kicked off the crawl. On March 9, Moxy will do it again. 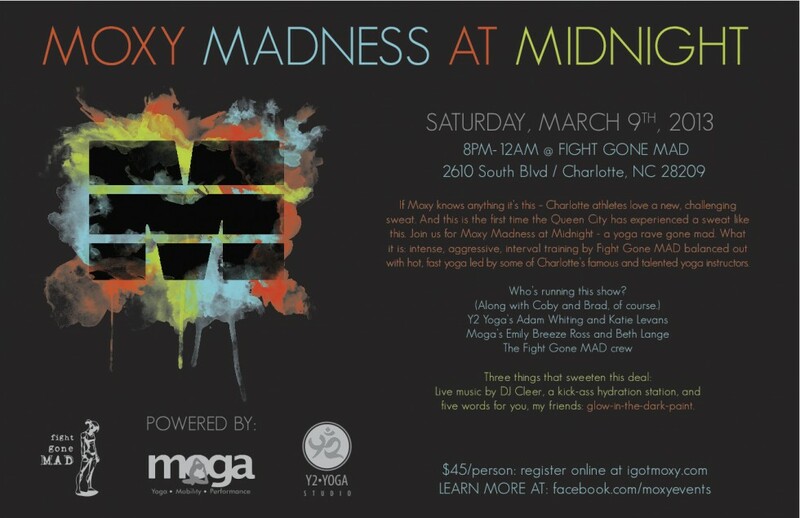 This time though, it’s Moxy Madness at Midnight, a four-hour yoga and athletic conditioning rave featuring talents we sweat with at Fight Gone Mad, Y2 Yoga, and Moga Charlotte. There will be black lights, glow-in-the-dark paint, a D.J., and a hydration station powered by corporate sponsors like VitaCoco Coconut Water, Kill Cliff Sports Recovery Drink, and Amrap Nutrition. Once more, it’s a first for Charlotte. Why this matters? “This is an opportunity to expose people to things outside their comfort zone in a unique environment, “says Brandon Cullen, CEO and Founder of Fight Gone Mad, who opened his newly-expanded gym space to Moxy for the March 9 event. Register at Moxy’s website, and check them out on Facebook for updates.